When they’re not competing for medals, the US Artistic and Rhythmic Gymnastics Team has had some serious fun shopping and relaxing poolside together during downtime. Host Town was important to adjust to the new time zone and settle into a new daily rhythm as a team. But this week, outside of their intense competition schedules, our gymnasts’ made time to address a truly serious matter: their health. 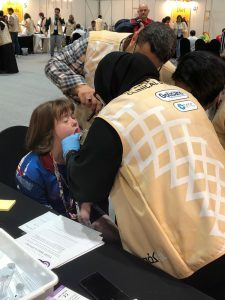 In just the first four days of the Games, more than 4,000 athletes and Unified partners were screened from 191 Programs around the globe. Many athletes housed in Dubai took buses to Abu Dhabi for the day just to participate in the FREE screening and treatment clinics. 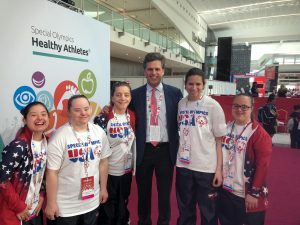 In addition to welcoming record numbers of athletes, the Program was also a wonderful place for celebrity sightings including Special Olympics Global Ambassador Apolo Anton Ohno, our Chairman Dr. Timothy Shriver, the USA Surgeon General Jerome Adams, USA Second Lady Karen Pence, former New York Yankees player Mariano Rivera, WWE wrestler Finn Balor and more! 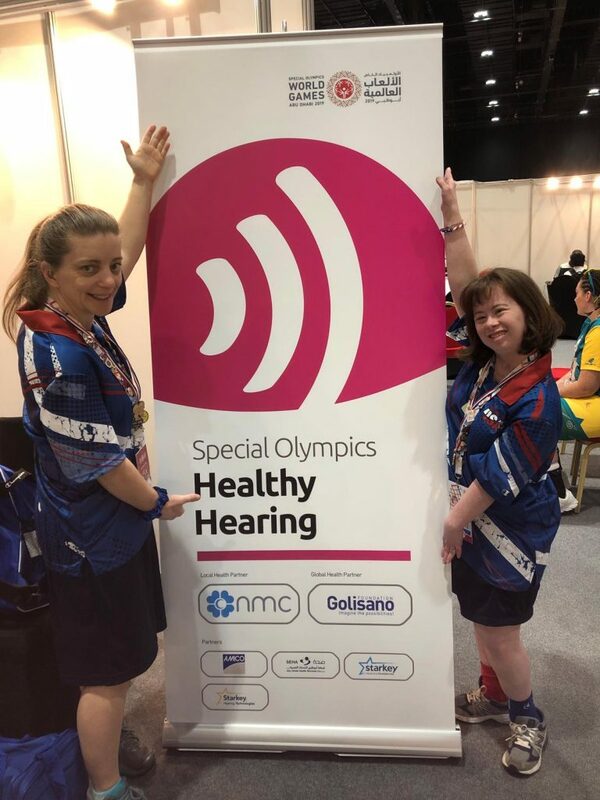 Using their celebrity to bring much-needed awareness to access issues and improved physical and emotional health is a vital component in improving Special Olympics athletes’ overall quality of life. After completing their visit, US gymnasts Beth and Tonya were each fitted with FREE hearing aids while Beth and Devon received FREE prescription glasses. They also received free dental exams and information on how to make healthy choices a part of their daily lives. We can’t help but wonder if all of this self-care helped “vault” these three to the podium in their respective events. You can count their many medals and ribbons by visiting the results section of our official team website: www.specialolympicsusa.org.